All finished! The binding went on yesterday and I washed it this morning. This quilt was my first hand quilted project. I started it in February, and actually constructed it quickly, but would set it aside and only work on the hand quilting occasionally. My daughter took this and the first photo. I may have to use this one for my blog header. In case you are wondering, here are the facts. The fabrics came from my stash. It's quilted with Gütermann and YLI white cotton hand quilting thread. I used size 9 between quilting needles. I didn't prewash any of these fabrics, but I used a Shout Color Catcher in the wash. (Nothing bled.) I can't remember what kind of batting I used, but I think it's either Warm n' Natural or Hobbs Heirloom 80/20. I'm fairly certain I used Moda Bella solid white and I don't think it washed up as softly as Kona. I marked my stitching lines lightly with a very sharp No. 2 pencil and a long ruler. The lines that didn't come out during quilting came out in the wash. I'm a total newbie at hand quilting, but I'm hooked. My sewing machine may be seeing a little less of me. I read your comments about hand quilting videos, so when I start hand quilting the Paintbox quilt, I'll shoot a little video. For beginners by a beginner. It's a stunner! And I just got hooked on hand quilting too, out of necessity. My machine free motion skills are pretty basic right now so I had to hand quilt some spirals on my last quilt. Now I'm sitting up late at night hand quilting my entire Little Folks quilt. Can't wait to see your tutorial video! New blog header for sure! It turned out wonderfully. I can see what it's been in the works since February! Are you going to hang it on a wall? I love it! I'm about to start one, too! I hope it turns out as well as yours did! So gorgeous! Congratulations on keeping that hand sewing going, such patience! Well done, it is fantastic. That's absolutely stunning. I can't believe it's your first hand quilting project! It's just beautiful and would make a great blog header! That is great, I 've been thinking about some handing quilting too...my machine quilting skills are not up for the spirals & loops I some times envision! Beginner? It's absolutely gorgeous and I know you have to be very proud!! getting my handwork out right now! I'm inspired! Absolutely beautiful! I haven't done much hand-quilting but I do enjoy it when I take the time. What a gorgeous quilt! can´t wait for your video, maybe i will give it a try, too (the handstiching, not the filming..). You did a great job! I love this quilt. If this is one of your first experiences with hand quilting.....you are off to a great start!!!!! it's beautiful! and makes a brilliant header. bravo! Gorgeous! I just did some handquilting this weekend, for the first time in a couple of years. I forgot how relaxing it is and how much I loved it. Hmmmm. Wonder why I haven't done any for a while. I have certainly needed some relaxation, for sure!! Melanie, it is gorgeous! I love your hand quilting and your fabrics are stunning. Enjoy your new quilt. Just beautiful! What a wonderful quilt, I love your fabrics and the quilting is lovely, well done! Hey there, I posted about my finished color wheel today too. BUT mine is much smaller than yours (mine is only a 16-inch square). Yours turned out so gorgeous! You should be so proud of this accomplishment. Love how it looks as your new header too. Lovely! I've hand quilted my whole life and find it very soothing and meditative....welcome to the club! You quilt is beautiful. I'm a brand new quilter and sewer too *lol* this is just GORGEOUS!! I hope to be able to make things like this one day! and am looking forward to your tutorial on hand quilting .. I have yet to tackle that. Thank you for the beautiful inspiration! Wow, that looks absolutely jaw dropping! 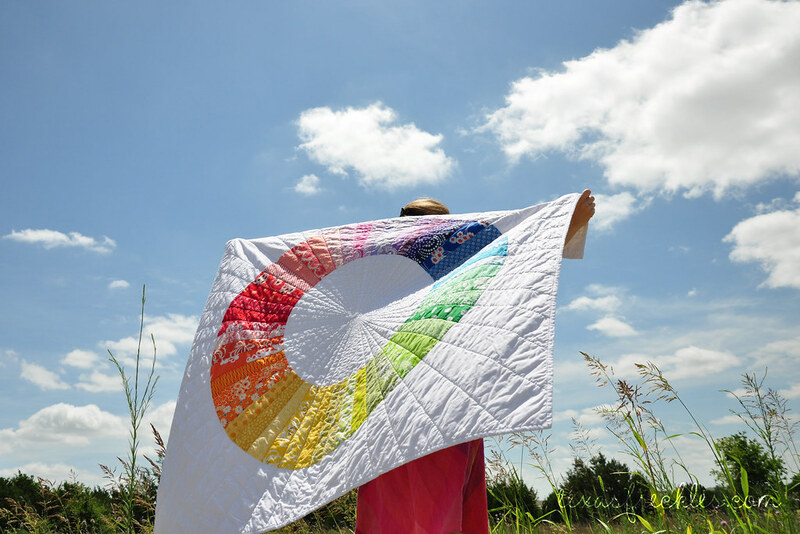 I can't wait to start on a colour wheel quilt just as soon as I've finished my sunshine quilt, which I'm definitely going to be hand quilting. 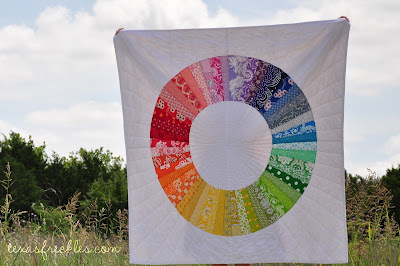 Hey Melanie, Your colour wheel quilt is awesome. Love it! I, too, am discovering the joys of hand-quilting and am looking forward to "graduating" from large stitch Perle cotton #8 to a smaller stitch in a thinner thread, something more like #30. 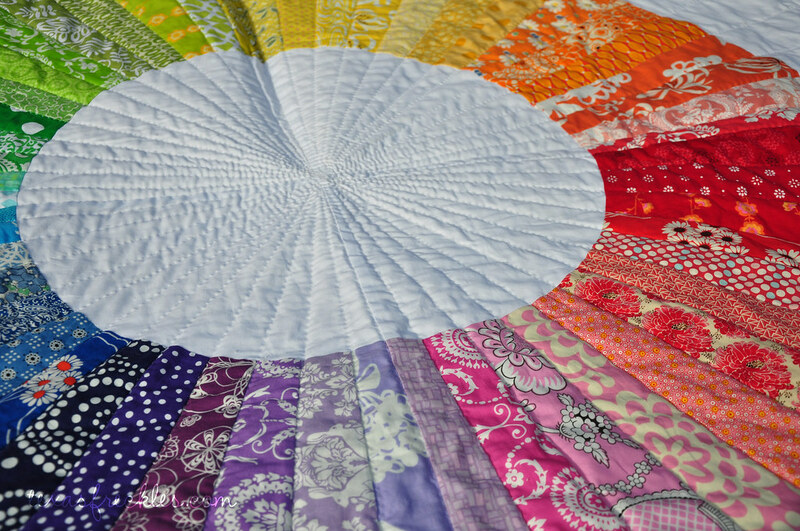 I'd love to have a closer look at the quilting on the colour wheel quilt. Melanie, It turned out just beautifully!! Love the photo shoot. I swear by the color catchers. They really do work!! Great job hand quilting and you were quite quick with it too!! It's gorgeous! and hand quilting is quite an accomplishment. I can't because of carpel tunnel in my left hand, so I'm jealous of all that create beautiful hand quilting. It is absolutely wonderful. I can't believe you haven't hand quilted before as it looks perfect. The video tutorial would be great as I have never hand quilted and so would love to learn. Thank you! Loved seeing this one in person yesterday at Guild! It was even more gorgeous!! Just wonderful!...and ,of course, I love your new header! this is beautiful! it's interesting that you found that the bella solid didn't wash up as soft as the kona solids. do you think that's usually the case? before washing i think the bella solids have a nicer texture than the konas. i have never really compared them after washing though. Wow, it looks great Mel! WOW! That is a beauty, nicely done! This quilt is stunningly spectacular! Great work! I love it! Great photos too. This is beautiful...and the picture is summer perfect! I love it! I'm a rainbow lover from way back when and this is just perfect. You did a wonderful job. Wow Melanie! That is beautiful. I am so excited about the "Beginner for Beginners" tutorial!! Yippee! I like that you've used all different scales of prints in your fabric choices. Makes it so interesting! I've done only a little hand quilting but plan to do more. My problem is lack of good lighting and a comfortable place to sit. I tend to hunch over my work a lot! I love your quilt! It's beautiful. Nothing is more gratifying than hand quilting. Great Job. Beautiful! What a treasure you have created!!! Wow! I am going to check out that book. What a great quilt! I have not had much luck with hand quilting. I would love to see your video! Thanks! Gasp, gasp, gasp! BEAUTIFUL, Malanie. Beautiful, beautiful, beautiful. So pretty + your great photos... I can't stop repeating myself! I just saw this on flickr, so lovely!!! Great job! Gorgeous! I'm impressed that you hand quilted this! I'm working on my own version of the color wheel quilt right now, just need to collect a few more fabrics.